These Self-Seal Double Window Envelopes are fully compatible with checks provided by your ADP Service Center. The tinted pattern printed inside the envelope provides complete security of the confidential information on the check. Protect payments going to employees, clients or other businesses. The security pattern keeps the checks you send confidential, and the self-seal design provides a quick and easy way to secure the envelope. Avoid the hassle of manually addressing envelopes. 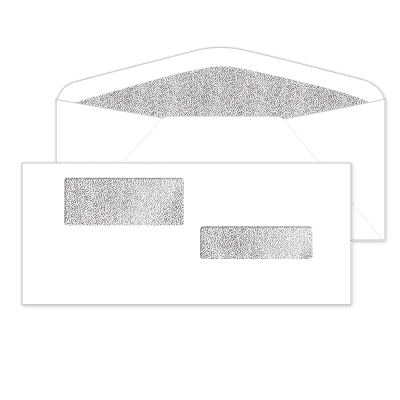 Your checks will perfectly align with the check envelope double windows, allowing your business address and recipient's address to show through.